I saw Oz Perkins’ recent ghost story I Am the Pretty Thing That Lives in the House long before I saw The Blackcoat’s Daughter and I suspect I won’t be alone. But Daughter was made first and did the festival rounds under the title February before distributor A24 picked it up and gave it the title change. It’s a good title change, I think. It makes sense and is appropriately Gothic and ominous. And if you’ve seen House, you know Gothic and ominous is what Perkins does best. And like House, Daughter is a minimalist slow burn of a horror movie that will be adored by some and completely rejected by others. Perkins favors slow movements, slow motion, slow zooms, long stares and ambient sounds to draw you into his minimalist stylized universe. The movie is like foreplay, seductive and teasing, with every small reveal feeling like a jolt when embedded in the opium haze of the narrative. And man, does Perkins love and pay attention to sound. I saw House in a theater and marveled at its all-consuming sound design, swirling and droning and heaving and breathing. And though I did not have the same viewing luxury with Daughter, you can still see/hear the blueprint of those aural leanings here, with discordant sounds and violin scrapes rising and peaking (Perkins’ brother Elvis has created a nightmarish tapestry of music that recalls the Climax Golden Twins score from Session 9) and cutting to silence and waves of music drifting gently, like music playing in another room. This expert attention to what we hear radically alters what we see, with otherwise benign images of snowy woods, girls looking at maps and walking down corridors taking on a new, unbearably sinister life. 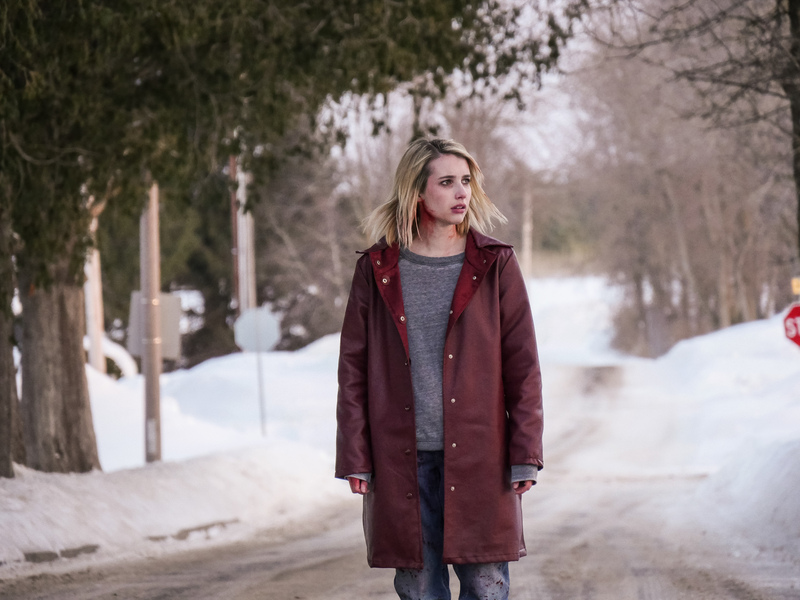 Vaguely supernatural and wholly psychological, The Blackcoat’s Daughter is a brooding, haunted and hypnotic movie experience. It doesn’t do all the work for you, rather it traps you in an environment and stares you square in the eyes, waiting for you to buckle. It’s almost pornographic in its use of portent. And those who thrive on this kind of genre cinema – and this writer is among that flock – will no doubt adore it. The Blackcoat’s Daughter hist select theaters on March 31st with a DirecTV premiere on February 16th.